Presented as part of the 2018 Hutchwilco New Zealand Boat Show Boat of the Show Awards, the 2018 Altus Innovation Awards were judged by an expert panel led by the vastly experienced Barry Thompson. The editor and co-publisher of boatmags.com, Barry is the undisputed doyen of New Zealand marine magazine editors, has been in the marine industry for more than 40 years and, in 2009, was inducted into the New Zealand Boat Show Hall of Fame. The awards were presented by Altus Industrial Solutions’ Area Sales Manager, Coralie Savill. This year’s exhibitors offered a wide range of impressively innovative entrants, especially from the marine electronics and outboard sectors. Although some of these entrants were a clever evolution of existing products or ideas rather than being truly innovative, there were also some truly outstanding and very innovative products on show this year. Two products in particular really stood out the Raymarine Quantum 2 Advanced Doppler Processing Radar and the Mercury V8 Outboard Motors. Although on first appearance these new motors appear much the same as previous Mercury outboards, beneath the skin they incorporate a number of unique features, resulting in very innovative new motors. These include AMS (Advanced Mid-Section), which translates into less stress on the transom, significantly reduced vibration and less noise; and Active Auto Trim (ACT), a unique and patented Mercury innovation that provides automatic fore/aft trim and therefore fuel savings. 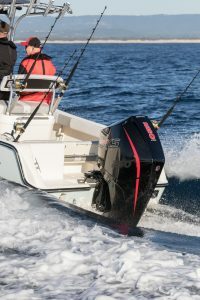 These new motors are also lighter and faster than other similar power-output motors and this results in even less fuel consumption, making them ideal replacements for existing, equivalent 2-Stroke outboards. The five entries this year’s were all notable, albeit in very different ways. The two finalists, the Fusion Apollo Series MJ-AP770 and the Blackbow Easy Sabiki were of very high calibre, even though one was a high tech piece of electronics and the other a simple, inexpensive fishing product. 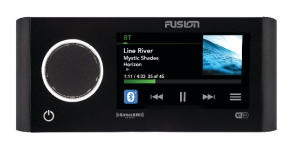 Incorporating revolutionary technology and a unique design, Fusion’s latest offering is the world’s first touch-screen marine stereo with built in Wi-Fi. Audio streaming via Wi-Fi delivers a higher data transfer rate in comparison with Bluetooth, resulting in much higher audio quality music from a longer range. It is the first Touch Screen 12-volt marine stereo in the world making it easier to use (even with wet fingers). The first Digital Sound Processing (DSP) marine stereo, it is able to be 100% custom tuned to every individual vessel. Fusion’s “Party Bus” Multi Source/Multi Zone system (another world first) means the crew can listen to different sources in different locations in the boat,; for example: TV in the cabin, FM in the cockpit, Bluetooth on the foredeck… or play the same music everywhere when having a party. If several vessels are all rafted up, the new Fusion Apollo Series will even allow their system to wirelessly link together over Wi-Fi, creating the “ultimate party experience”.